Why oh why do I always end up with whatever the kids bring home? Look mom matching pharmacy bags. D took a half day today to bring Z into the clinic because we thought that she had another ear infection. Well the good news was that her ears were clear the bad news was that she has strep. He asked them to test her because it is going around at daycare. Well, I have had a sore throat for 2 days and thought that was it until her test came up positive. On the up side her doctor just cut me a prescription without the test because it has a tendency to spread within a family so the odds were good that thats what I have. Bonus points for not having to do the strep test because that test is the worst. I would rather go to the lady doctor every day for a week than do a strep test. Heck I would do it for a month if it meant that I didn't have to have that giant q-tip jammed down my throat. So Z spent the afternoon getting our meds and doing some shopping at Target. I spent the evening being lazy and feeling like crap while I knit away on my next pair of socks. This pair is for myself. It is a standard k3, p1 rib with 56 stitches. I used Lana Grossa in the color 8348. This is my third pair of 2015. My goal is 10 pair so I think that I am off to a good start. 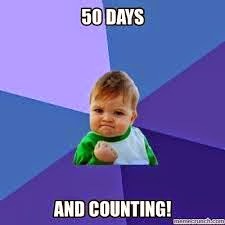 Also, if you are still keeping track today is day 50 of being smoke free!